Figure 4. 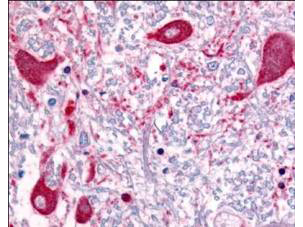 IHC analysis of ROBO1 using anti-ROBO1 antibody (A01530-1). ROBO1 was detected in paraffin-embedded section. Heat mediated antigen retrieval was performed in citrate buffer (pH6, epitope retrieval solution) for 20 mins. The tissue section was blocked with 10% goat serum. The tissue section was then incubated with 1ug/ml rabbit anti-ROBO1 Antibody (A01530-1) overnight at 4°C. 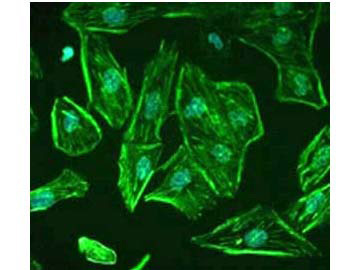 Biotinylated goat anti Rabbit IgG antibody was used as secondary antibody and incubated for 30 minutes at 37°C. 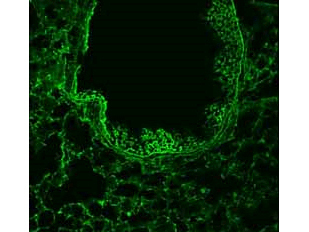 The tissue section was developed using Strepavidin-Biotin-Complex (SABC)(Catalog # SA1022) with DAB as the chromogen. Staining of ROBO1/200. DAPI was used for nuclear counterstaining.Image from Lindenmeyer MT et al.Systematic Analysis of a Novel Human Renal Glomerulus-Enriched Gene Expression Dataset. PLoS One. 2010 July 12;5(7):e11545, Fig 5. Figure 7. 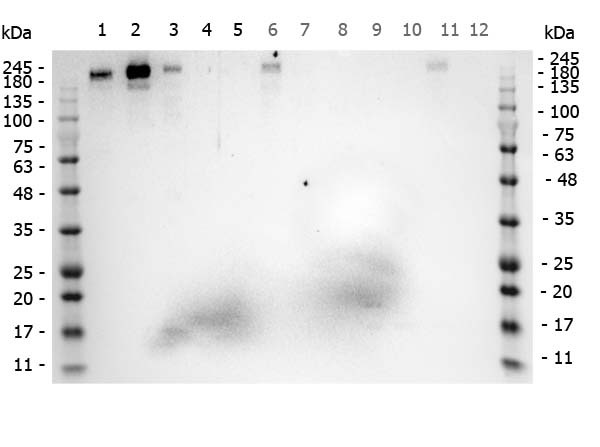 Western blot analysis of ROBO1 using anti-ROBO1 antibody (A01530-1). After Electrophoresis, proteins were transferred to a Nitrocellulose membrane at 150mA for 50-90 minutes. Blocked the membrane with 5% Non-fat Milk/ TBS for 1.5 hour at RT. 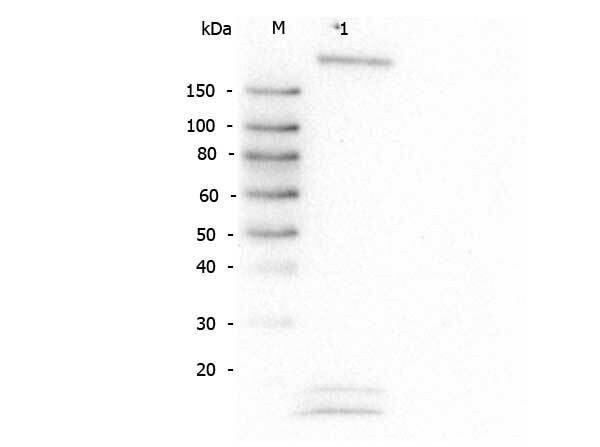 The membrane was incubated with rabbit anti-ROBO1 antigen affinity purified polyclonal antibody (Catalog # A01530-1) at 0.5 ug/mL overnight at 4°C, then washed with TBS-0.1%Tween 3 times with 5 minutes each and probed with a goat anti-Rabbit IgG-HRP secondary antibody at a dilution of 1:10000 for 1.5 hour at RT. The signal is developed using an Enhanced Chemiluminescent detection (ECL) kit (Catalog # SA1022) with Tanon 5200 system. A specific band was detected for ROBO1. Figure 3. Western blot analysis of ROBO1 using anti-ROBO1 antibody (A01530-1). Figure 2. 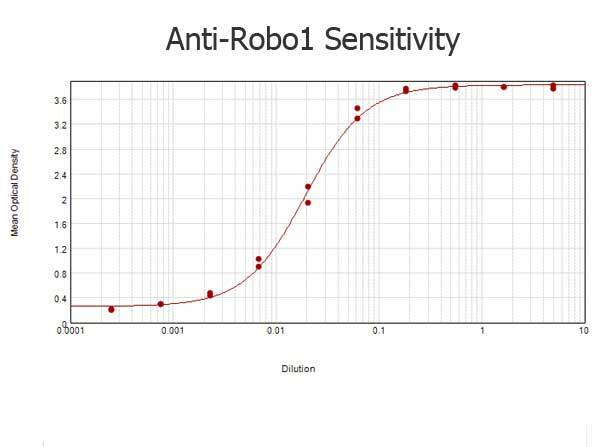 Western blot analysis of ROBO1 using anti-ROBO1 antibody (A01530-1). Store vial at -20° C prior to opening. Aliquot contents and freeze at -20° C or below for extended storage. Avoid cycles of freezing and thawing. Centrifuge product if not completely clear after standing at room temperature. This product is stable for several weeks at 4° C as an undiluted liquid. Dilute only prior to immediate use.